Clients often think they should definitely put the TV above the fireplace. There are alternatives you can consider. In the top photo, their mantle was 5 1/2′ tall (due to code requirements), so the top of the TV would have been almost 9′ tall. According to ergonomic professionals & Physical Therapists, looking up to watch TV causes a strain on the neck. My own TV is above the fireplace, the builder did it before we bought the home. I must admit, we do get a sore neck after football days! Today there are more options than in the past, because today’s TV brackets pull out & swivel for easy viewing from all angles. 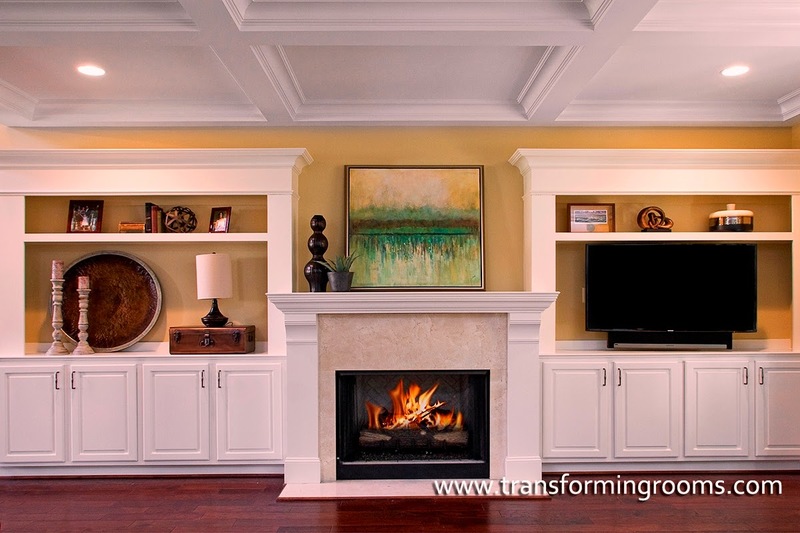 I found several photos on Houzz showing TV’s beside the mantle instead of above it (one example on right) – this helped the client visualize options. They tell me they are VERY happy with the placement they went with (above). We feature a list of the pros and cons of below. The advantage to a TV over the fireplace is the room will normally be symmetrical, and symmetry may be very important to you. Look at photos you’ve gathered in the past – are the nightstands, bookcases, etc always symmetrical? 3) The heat is hard on your electronics, according to professionals, (link below), although my TV is 3 years old, and it hasn’t seemed to hurt it. See Below -Notice how much higher the top of the TV is than someone sitting on the sofa? 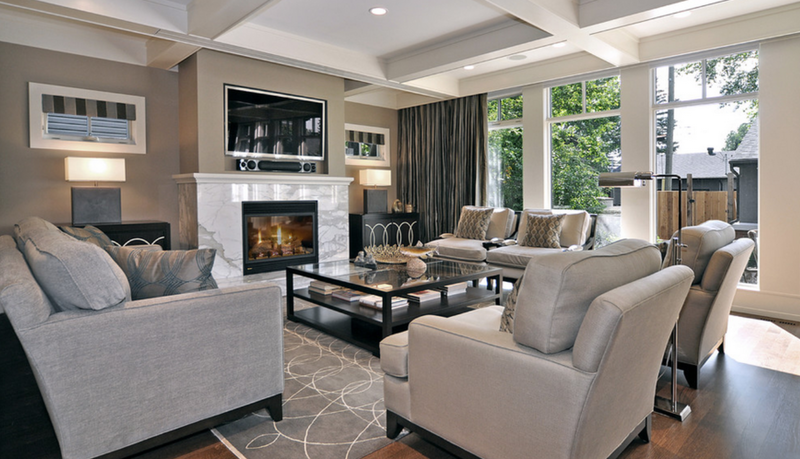 1) What do you want the main focal point of the room to be? 2) Would you rather be watching TV at eye level, or at a level that requires you to look up? Clients often tell me they wish they didn’t have to look up to a TV that is hung high. So I’d love to hear your comments! We love feedback! For questions, be sure to email instead. 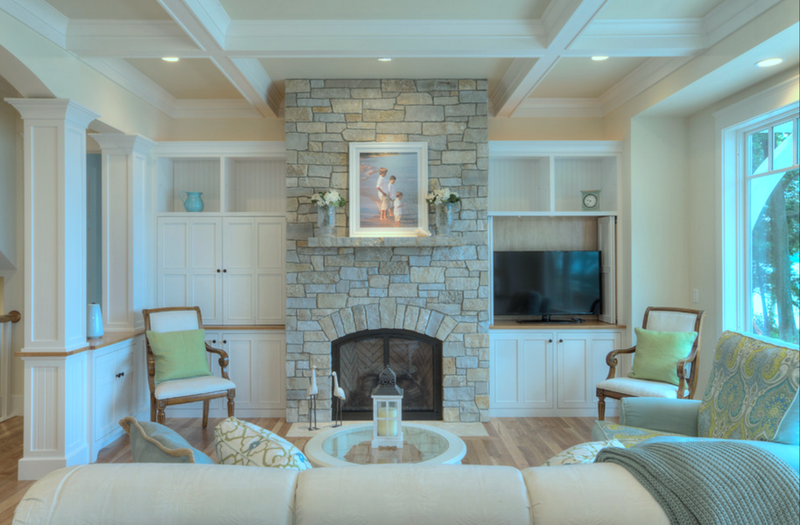 Whether a Television should be above the fireplace mantle is personal preference, but keep in mind the pros and cons before you drill and hang the TV. If in doubt, perhaps you can try it in a “temporary testing location”.